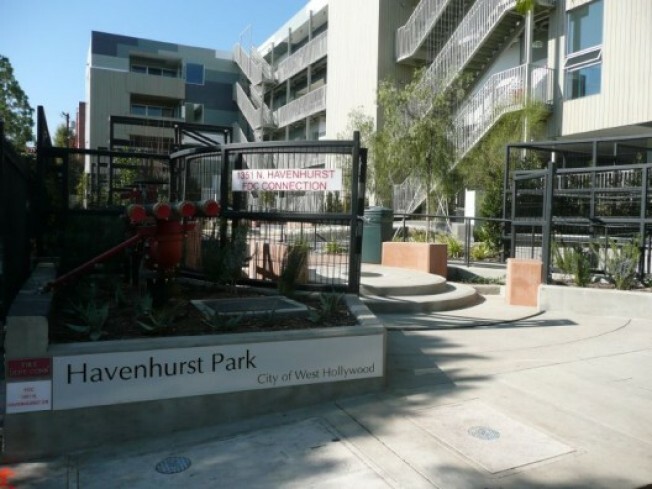 This pocket park in West Hollywood could be an example of so-called urban acupuncture, a term used by City Council President Eric Garcetti to describe a Los Feliz park last year. With water poles, benches, and natural vegetation, the tiny park, which opened in November, is the first of developer Richard Loring's two parks in West Hollywood. This one is outside his Habitat on the Park condo project at 1351 Havenhurst, while the other park is outside Loring's other project, the Lorcan O'Herlihy-designed Habitat on Formosa project at 1140 Formosa. Both were designed by landscape architect Katie Spitz (construction shot of the Formosa park is the last pic in the gallery). Since these are public parks, do non-residents use the park at Habitat? "I've one person sunning themselves and I saw someone sitting at their computer," says Lisa Paperno, the listing agent for both building. "They both weren't from the building." On the other hand, if you do live in the building, would you get greedy and not want outsiders sitting in the green space outside your door? Meanwhile, in terms of sales, there are six units left at Habitat, which opened for sale in spring 2008, while the Formosa project, which went to market late last year, has seen prices drop approximately $200,000 a few weeks ago. The lowest unit is now $588,500. While the building hasn't sold any units yet, Paperno says the recently-announced price drop pulled in a few offers and she expects to close escrow shortly on a handful of units.